Hipster Whale, the makers of the original Crossy Road, in a collaboration with Disney have released a new game that’s very similar to the original, except for one big difference – it’s based on Disney characters. 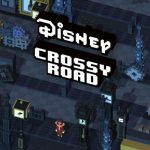 Disney Crossy Road is currently available on iOS devices only, but the success of the original title should mean an Android version is coming very soon. Again, Hipster Whale asks you rhetorically about the chicken, but the question is now different – why should the chicken get all the fun? And you also get the same eight-bit graphics in this game, as you “tap and swipe your way to a record-setting number of steps.” You can collect more than 100 Disney and Pixar characters, including Donald Duck, Mickey Mouse, and Mufasa for the former, and Buzz Light Year and Wreck-It Ralph for the latter. You can also encounter iconic eight-bit versions of classic Disney and Pixar locations, with chiptune versions of songs from your favorite movies from those companies. We won’t waste any more of your time and tell you more about the game, because that’s all there is to it. 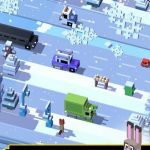 So, with that in mind, let’s cut to the chase and bring you our Disney Crossy Road strategy guide. For starters, you should make sure you’re playing the game in landscape mode. This allows you to see much more of the in-game environment than you would if you were playing in portrait mode, and to choose a better route along the way. Besides, most games are best played in landscape mode anyway, so this one should be a no-brainer. The mechanics of this game are just as simple as they were in the original. Just tap to move along and see more of the world, but when tapping, do not tap with your finger in front of your character. That leaves you running the risk of blocking your view, so instead of proceeding on a dangerous route where your finger is blocking the way, try tapping with your finger behind your character. It might not be the usual way to do things for some, but it’s the best way to do things in this game. 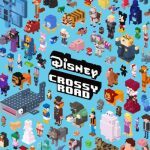 We did say above that the main difference between classic Crossy Road and Disney Crossy Road is the characters. But when it comes to the true basics of the game, both titles are very similar to each other. It’s all about getting as high a score as possible and collecting more coins. Still, you’ll have to be on the lookout for all those new and unusual obstacles; they would usually appear only on one level, but there are some obstacles that were placed in the game on purposes, so you have to be on the guard for those too. There are myriad worlds to explore in Disney Crossy Road, but which one should you play in? 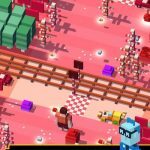 It’s really up to you – a level that may be extremely hard may give you a good challenge, while levels that are much easier shouldn’t be a problem , even if you played the original Crossy Road. Try all the possible environments so you don’t just get a feel for the game, but also become better and choose the environment that suits you the best. The game also comes with boosts that are unique to a certain level. These include the likes of the energy rings in the level based on Big Hero 6. Leaping inside one of the rings allows your character to be launched forward at high speed. This is an easy way to get 50 points, as you’ll be landing at a much farther distance from the point where you were launched. In this game, there will be many a situation where you would have a difficult time moving forward and exploring more of the map. Camping out when this happens is normally a good decision, but you should take note that the eagle from the first Crossy Road game is here as well. Camping out in one spot would draw the attention of the eagle, who’s back to end your game when you least expect it. Considering this, it might be a good thing, as it would allow you to learn how to think on the fly. Always be moving around, because keeping still in one area would be all the eagle needs to swoop down on you and end your run very quickly. When you encounter obstacles such as rivers, you can save yourself by going backwards. And we place special emphasis on the “saving yourself” part here. By going back while on a river, you can potentially leap onto a log that will quickly send you to the other side of your device’s screen, and onto safer ground. When crossing the road, those super-slow vehicles can be a real annoyance. Then you’ve also got other obstacles that seemingly take forever to get out of your way. What you need to do here is to side-sweep; do this trick by swiping toward the left or right sides of your screen. This allows you to buy some time and move out of harm’s way faster, provided you have the wiggle room to go so. The roads come with their share of openings, and you can potentially cover a wide range by transitioning into a straight line. But in order to do this, you’ll have to find the right opening. You can also leap as close to the rear end of a vehicle as you could, as that could buy you the most time before another vehicle arrives. This might be something you’ll need to do for quite a while on the road, but if you master those transitions into openings, or those jumps to the back of a vehicle, you shouldn’t have a problem. And this completes our exclusive strategy guide for Disney Crossy Road. Do you know other hints we haven’t included in this guide? If so, don’t hesitate to share them with us by commenting below!